There is nothing so amazing as the natural beauty of Estes Park. Come join us at Fall River Village. This two bedroom, two bathroom condo will open the door to a world of enjoyment that lasts throughout the seasons. Our stylish riverside condo is located on the west edge of Estes Park, CO, and offers all of the convenience of town yet the quiet of out of town. The condo is only minutes away from world class fly fishing, hiking and rock climbing. 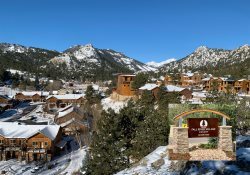 Take a nice stroll from the condo and within minutes you'll be in downtown Estes Park where you can experience local restaurants and boutique shopping. Let Fall River Village be your headquarters for a family vacation, a romantic honeymoon, or a gathering with friends. We offer a fully equipped condo: full-size kitchen appliances with silverware, dishes, pots and pans, smart televisions in the living room and bedrooms, and free fiber wifi. One bedroom has a king bed, the other bedroom a queen bed, and the living room has a queen sofa bed with an upgraded mattress. This condo sleeps 6 people in 753 square feet and is not pet friendly. Please check out the property map page and policy page for more information.